For hours of creative writing, drawing, and just plain fun – the new two-sided Take it Easel from B. Toys is a budding artist’s dream! No need to waste paper – this reusable easel features an erasable whiteboard on one side and a chalkboard on the other, becoming a tabletop easel or chalkboard in an instant. 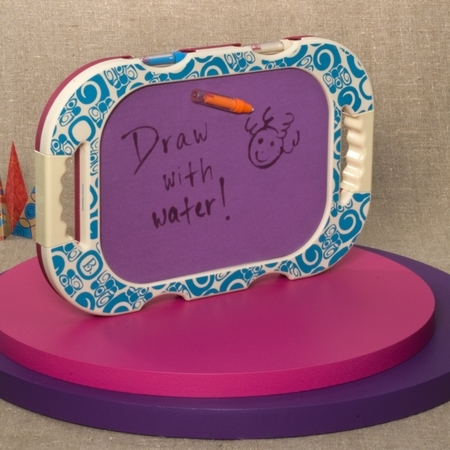 Just pull the handle up and click it in place when ready to draw and create! With an extremely handy handle for carrying the easel to the desired location, the Take it Easel is portable, which makes it a great item to pack along for trips to Grandma’s when on-the-go! 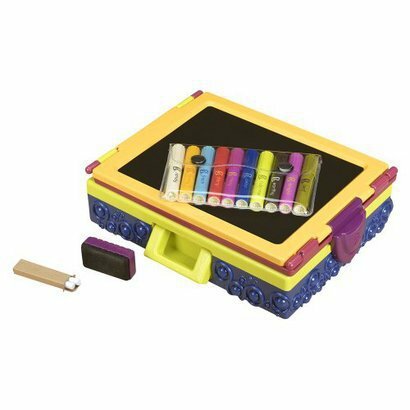 It holds art supplies right inside when closed, and comes with 10 non-toxic washable markers, an eraser and chalk to get your child started! “Mom’s” little one is having a blast carryng the Take it Easel all around the house to play and draw, and “Mom” loves how easy it is to clean up! To learn more, visit B. Toys, or purchase one at Target.com or OneStepAhead.com. Just in time for Valentine’s Day Fun, the new Wheeee-ls! by B. 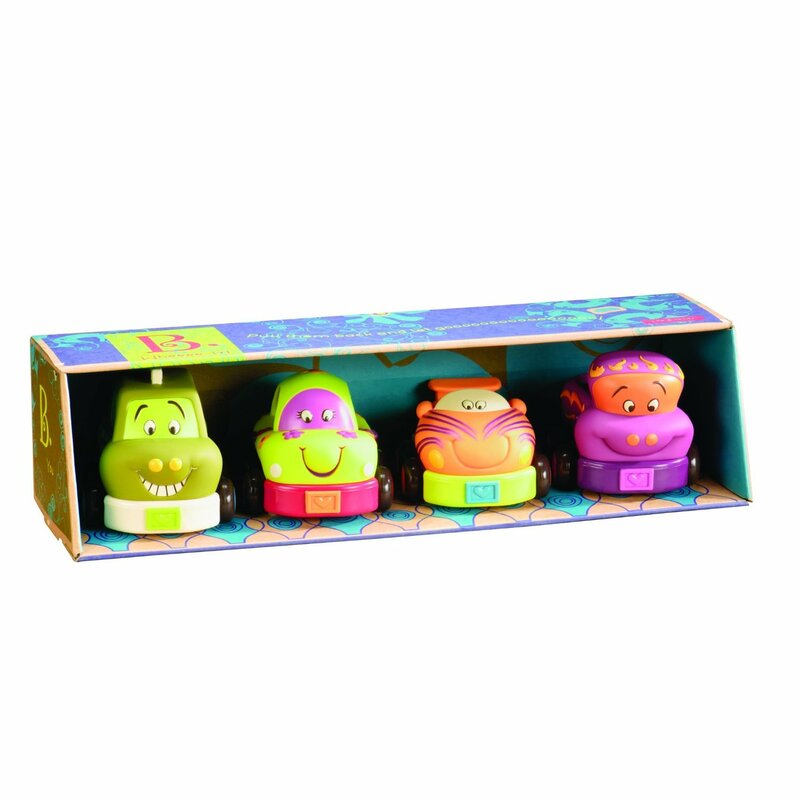 Toys will race into your little one’s heart as an adorable treat that is sugar-free! With 4 vehicles that each have a heart license plate, the bright, bold cars & trucks are entertaining and just plain fun! Your child will love to pull each car or truck back to watch how far it will go! “Mom’s” daughter couldn’t wait to get them out of the box to play! 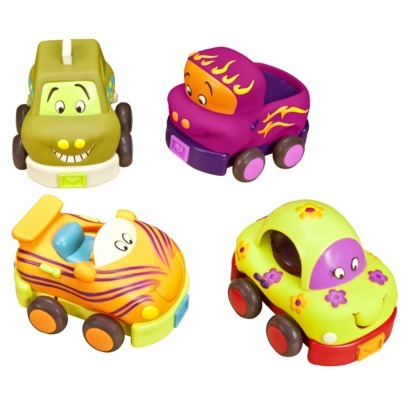 NO batteries are required for these chunky vehicles, sized just perfectly for tiny hands! Each one makes a different noise – the car rings, the truck chimes, the racer rattles and the taxi squeaks. For ages 1- 4, Wheeee-ls! by B. Toys can be found at Target stores nationwide. Please visit justb-byou.com to see all of B. Toys’ unique toys and games for children. http://tinygreenmom.com/wp-content/uploads/2018/07/logo-sm.png 0 0 Tiny Green Mom http://tinygreenmom.com/wp-content/uploads/2018/07/logo-sm.png Tiny Green Mom2012-02-08 18:38:302012-02-08 18:38:30Wheeee-ls! As John Denver said in song, “The season is upon us. A time for gifts and giving.” Who is the most fun to buy for at the holidays? The kids, of course! “Mom” at Tiny Green Mom has chosen her very favorites for babies, toddlers, preschoolers and elementary-aged children for 2011. For the youngest member of the family, JuneBee Baby offers over-the-top adorable, luxuriously soft, stylish children’s clothing, all made lovingly with pure natural fibers in one-of-a-kind designs! Each piece of whimsical clothing will have your baby or toddler warm, toasty, and eco-chic through the season. Plus, a portion of JuneBee Baby sales is donated to “Generation Rescue” to directly help families with autism. For the tiny eco-explorer in your life, the Maple Landmark Push N Pull Bunny is an excellent choice! When your little one is a crawler, the Push N Pull’s large handle is sized for little hands to push the bunny across the floor. As your child grows into a walker, a string can be attached to the front of the bunny through the hole, and it becomes a pull toy. The Push N Pull is crafted from locally sourced, responsibly harvested maple with hardwood components and laser detailing on both sides. For ages 6 months +. Shake, rattle and roll – this wooden rain maker from B. toys sounds like rain gently falling against the windowpane, and your budding musician will love to sing and dance to the beat! A perfect choice for children ages 18 months to 3 years, this is one musical instrument that will definitely be a hit with the whole family! Hathi Chiti uses eastern-themed characters and concepts as a gateway to educate little ones about different cultures around the world. 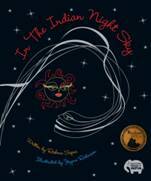 Children ages 3 and up will delight reading about Indian folklore and culture through this beautifully illustrated book written by Reshma Sapre and illustrated by Jayme Robinson. 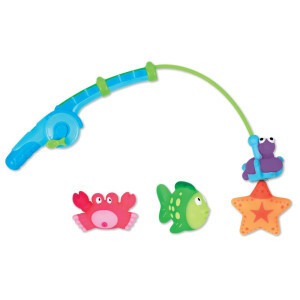 Encourage your future marine biologist or deep sea fisherman with this BPA-free bath toy from Munchkin! A magnetic fishing pole catches sea squirts and makes “reel” clicking sounds – making bathtime fun and enjoyable all through the winter. 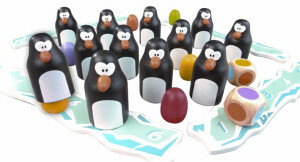 Children ages 4 and up will adore this all-wooden, eco-friendly memory game taking them on a South Pole Eggspedition! Be the first to collect six penguins with their eggs on an iceberg to win. 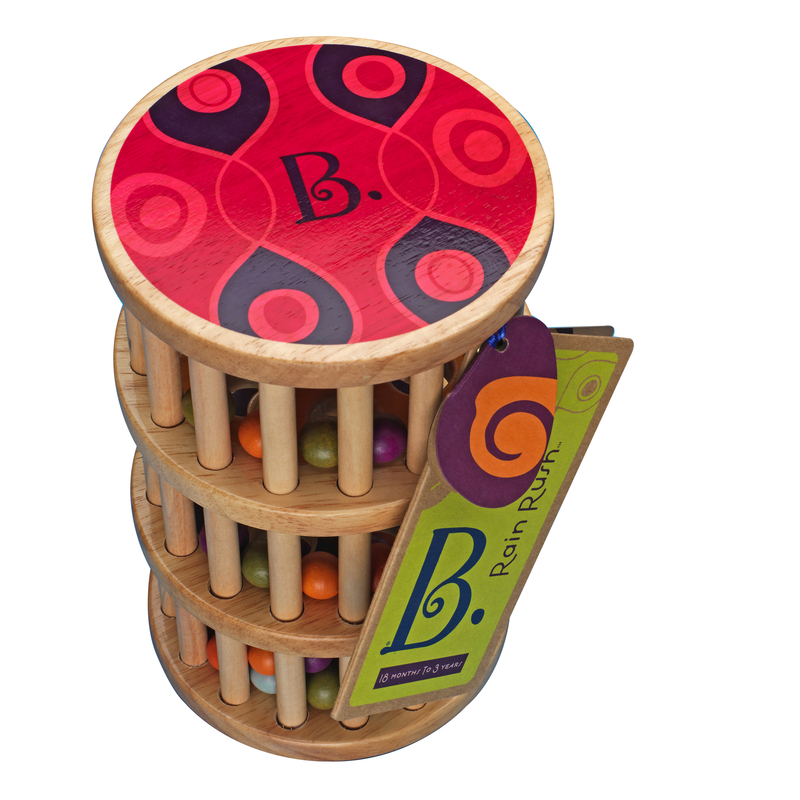 This award-winning game teaches color recognition, memory, visualization, and social skills. It’s a gift that gives back too, as Blue Orange plants two trees for each one used in game construction! 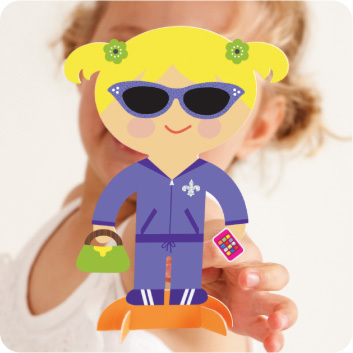 For unplugged, imaginative fun for your granddaughter, daughter or niece, hello paper dolls are sure to inspire creativity! Choose from 4 paper doll princess kits – each comes with a large 6″ paper doll princess and royal pet, 2 sheets of punch out clothing, 1 sheet of fashion accessory stickers and a unique stencil for endless designs. Made with FSC-certified uncoated recyclable paper. 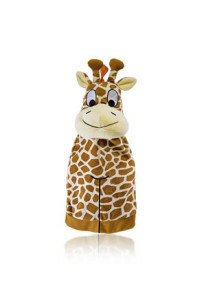 Kids love giraffes, and this particular Giraffe Hot Water Bottle is perfect for a bedtime cuddle buddy during the chilly winter months. Includes a removable travel size Fashy thermoplastic hot water bottle that has a large opening for easy filling, and retains heat for hours. It is odorless, recyclable and safe, and features an adorable machine washable cover. Baby can twist, bend and chomp on this non-toxic Twisty® Figure 8 Teether Toy from Munchkin! Winner of the Parents™ Choice® Gold Award, it is no secret why this is a hit with babies ages 6 months and up! Easy to hold, with bold colors, a fun rattle sound and soothing textures for sore gums – this is one toy that will be packed again and again in your diaper bag! 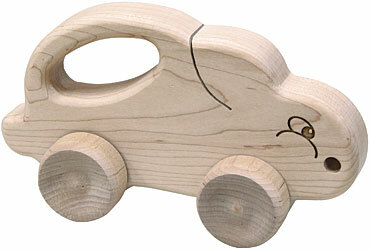 It is definitely a hit at “Mom’s” house – even toddlers enjoy bending it into different shapes! 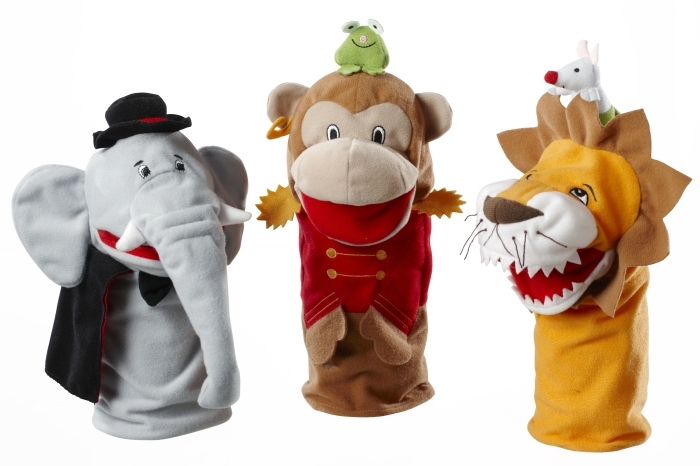 The Twisty® Figure 8 Teether Toy is available nationwide at Target, as well as online at Munchkin.com. With so many toys on the market, how can you possibly know which ones are best for your baby? In just a few, quicksilver years, your helpless infant will become a competent youngster-walking, talking, socializing, reasoning. In fact, within the first four years of life, children develop a full 50% of their adult intelligence! That’s how fast their brains are growing. Giving your baby stimulating, age-appropriate toys will help your child develop faster and more fully-cognitively, physically, creatively and more. Understanding how babies learn is the key to knowing what toys to provide. Babies are born virtually programmed to learn. Before birth, genetics determine how the brain is “wired.” Neurons travel to different parts of the brain, forming connections, called synapses, that await stimulation. Once a baby is born, every experience-sight, sound, touch, taste and smell-helps stimulate those synapses and create trillions more. The more complex these interconnections, the brighter a child will be. By providing your child with early stimulation and a wide range of experiences, you can accelerate your baby’s development. Even the tiniest newborn is poised to soak up sensory data like a sponge-and in doing so, stimulate brain development. A newborn’s vision is limited, which is why tiny infants respond best to black-and-white objects, bright colors and bold graphics. But vision develops quickly, along with motor control. As early as the second month, babies will begin studying their hands and swiping at objects. Most begin rolling over between two and six months. During this period, babies discover cause and effect-shaking, banging and pushing every object within reach. Hand-eye coordination improves; favorite games are “clap hands,” “pat-a-cake” and “peek-a-boo.” Most babies begin crawling around seven months and by ten months, many are starting to “cruise.” In addition, they begin to put sounds together to form simple words. – Storybooks that you read to baby. Many children begin walking around their first birthday, and with this exciting new skill comes a strong desire to explore. Most toddlers are goal-oriented and driven to experiment. They begin imitating grown-ups physically and verbally. Through constant activity, they begin strengthening large muscles and improving fine motor coordination. At this age, tots begin using their imagination. Children engage in imitative and make-believe play and problem solving strategies. 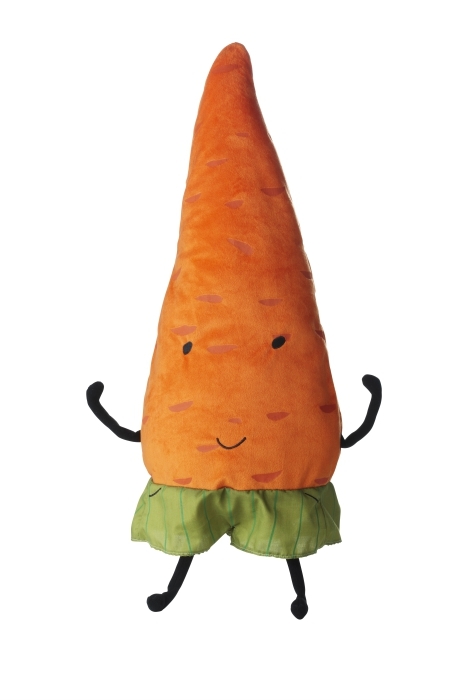 They can match objects by shape and color, follow simple instructions, and dance to music. Language also explodes around 18 months, and toddlers acquire new words at a mind-boggling rate. – Storybooks that you read together. Fine motor coordination is on the upswing! Now kids are ready for arts and crafts projects, simple sports and beginning board games. Children this age are very responsive to music, videos and books. By the time they reach their third birthdays, most kids are fluent talkers. With this growing competency, many are ready for more “big kid” toys. This set is unlike the normal DIY sets of the past. Once your child opens the box they find a set of instructions and a list of recyclable items they need to find in order to build the ship or UFO. After a fun scavenger hunt the set shows how to use these recyclables to build the ship and gets a fully functioning pirate ship or UFO to play with. This toy teaches how to use recyclable items for other uses while sparking creativity and ingenuity. The doll house of yesteryear got a green make over. 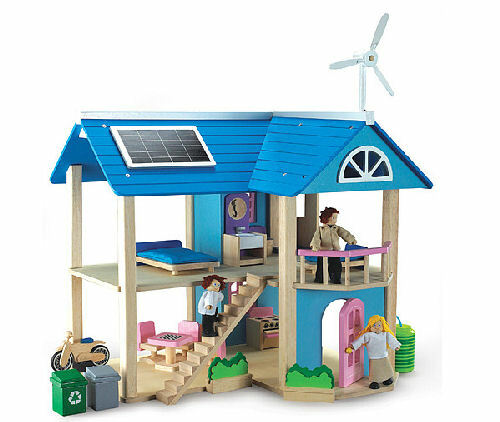 This eco-friendly doll house is made of recycled wood and materials and comes complete with full rooms and a family. It also includes environmentally conscious themes such as recycling, rain water collecting, wind turbine, and solar panels. It aims to teach your little one about recycling and alternative energy sources that will sustain earth’s natural resources. 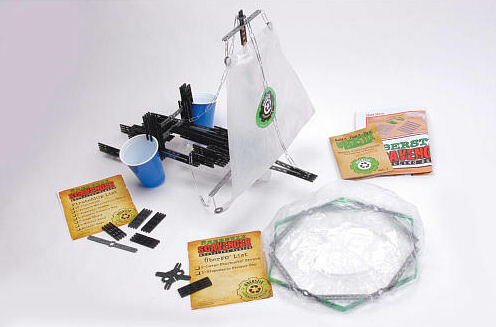 This is a fun and educational set to help your child learn to go green. This kit is perfect for your robot loving youngster. 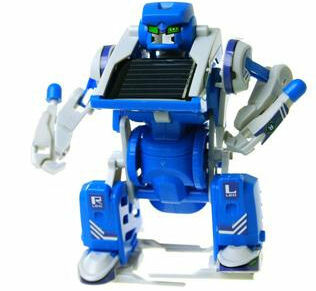 In this kit your child learns about solar power by putting together this transforming robot. Running completely on solar power the robot transforms into a tank and a scorpion, but not until it is put together. The kit comes in pieces with instructions for your child to put it together. It is an educational and fully functioning model kit for your little one to learn about the power of the sun. This kit is suggested for children age 10-15. 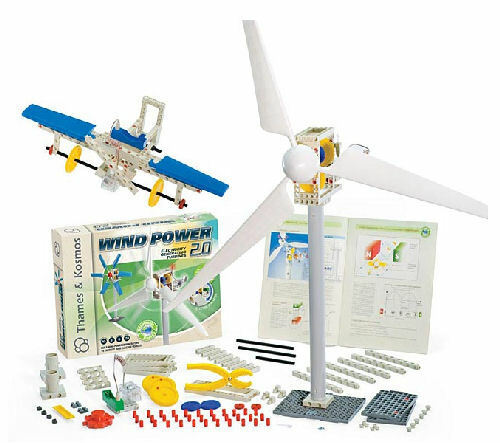 This 133 piece kit explains how wind power can create a stored power source and lets your child build their own rechargeable wind power system. It comes with a manual to show how to build the turbine, attach it to the charging dock, and even includes 8 designs for building battery powered models. It includes one AA rechargeable battery for the docking stations. After building the models the AA battery powers them for hours of fun. If they complete the 8 models the creativity kicks in. They can experiment with the pieces to create models of their own design and power them. This kit is a great way to get your little builder into sustainable design and technology. It teaches green power, design, and electricity all while having fun. Whether your goal is to teach greener energy, recycling, or spark creativity, these toys can inspire children of all ages. 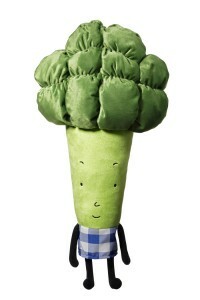 Eco friendly toys are becoming more available and the lesson of earth friendly living is priceless. This year take the earth in consideration and give your children hours of entertainment and creative learning. 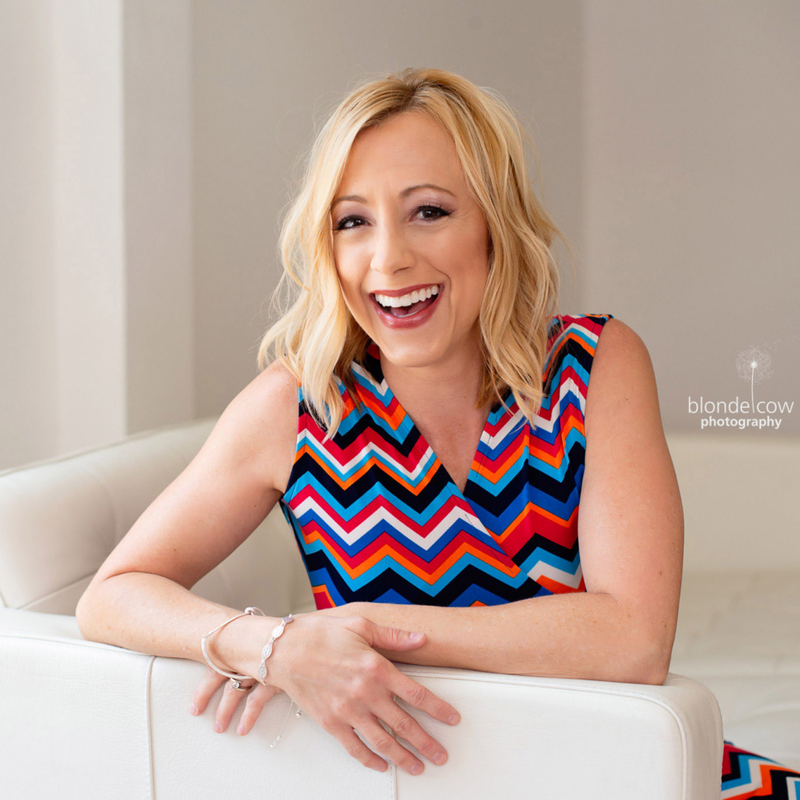 Writer Angie Pomilia is also a content contributor for Brainz, a topical website urging us to learn something new and share it with others — whether it’s a list of the best dollhouses for girls or 14 easy meals every guy should know how to make. Things are getting whacky around “Mom’s” house! B. Toys sent over their Whacky Ball game for children ages 1 to 3 years old, and this little game has been providing quite a bit of action the past few days! 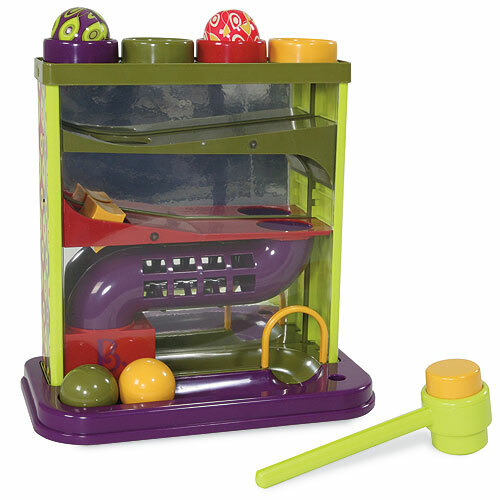 The hammer squeaks as the balls are hit into the hole successfully and down they come – one by one into the tray at the bottom. 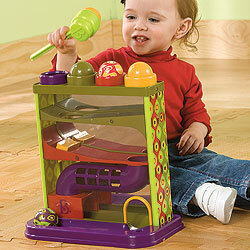 Developing hand and eye coordination is fun with this toy that provides hours of entertainment! Get the whole family involved in a “whacking” session – pun intended, of course! Etched patterns & sensational colors make B. toys a work of art. Don’t hide this toy away when company comes! To learn more about B. Toys and their entire line of educational and just plain fun toys for little ones, visit justb-byou.com. Have a toddler or preschooler who wants to do homework just like their older siblings now that school has started? Check out the new H2-Whoa! from B.toys! This reusable, two-sided drawing board uses pens filled with water to write and draw – with absolutely no mess! The water just dries and disappears for your little one to draw a new picture or practice letters & numbers! “Mom” loves how the pens slip easily into the four holders on the side of the drawing board when not in use, and there is a convenient handle to carry it when on-the-go, making it an excellent, mess-free option for car trips! Did we mention that there is no mess to clean up?! The drawing board features two sides to draw on, so your child has a choice of color for their masterpiece, and the pens can be easily refilled with water when dry, whether at home or away. H2-Whoa! will be your child’s favorite pick for drawing and writing, and you will love that there is absolutely no clean-up involved! Long trips to Grandma’s, here we come! To locate a Target retailer near you that carries H2-Whoa!, visit justb-byou.com. http://tinygreenmom.com/wp-content/uploads/2018/07/logo-sm.png 0 0 Tiny Green Mom http://tinygreenmom.com/wp-content/uploads/2018/07/logo-sm.png Tiny Green Mom2011-08-23 18:14:372011-08-23 18:14:37H2-Whoa! 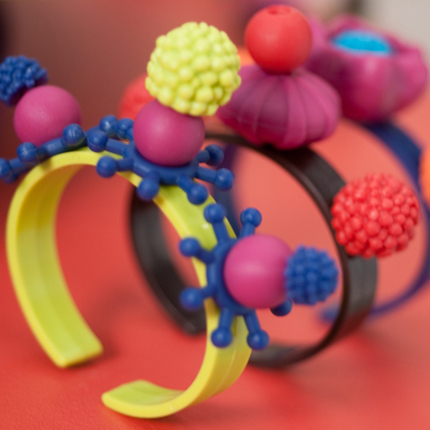 Spark creativity and bring out the ooh-la-la in your children as they make and design their own fashionable jewelry with the help of Pop-Arty! by B. toys! This fabulous jewelry design kit was made for children 4-10 years of age, and includes 500 pieces of snap-together jewelry for endless combinations! With 12 rings and 6 bracelets, plus pieces that can be strung together to make necklaces of any length, your future fashionista will delight in making new jewelry to match outfits or dress-up clothes. The 500 pieces are packed in a reusable container with a tag containing instructions and inspiration made from recycled paper. This all-in-one packaging makes gift-giving a breeze, too! What “Mom” loves is how easily the pieces snap together and come apart for little fingers. There truly is no end the amount of beautiful creations that your child can design – this is a toy that will grow with your child, as well! 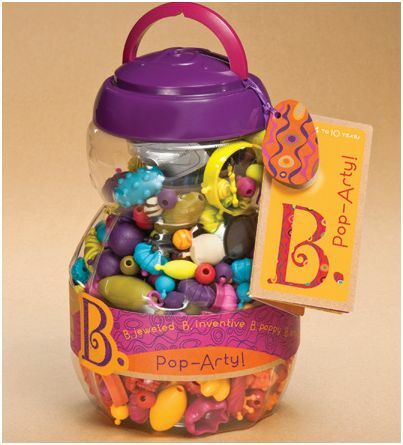 What will your budding artist or fashion designer make using Pop-Arty!? 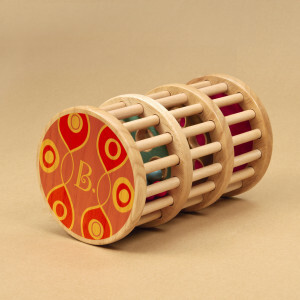 For more information on B. toys, or to locate a retailer near you, visit justb-byou.com.